If you have an appetite for travel, you must have heard of the term “air miles”. Usually, it comes tagged to a credit card — so, air miles credit cards. The concept is simple. You spend money on the card, you earn points called ‘air miles’, and if you earn enough, you can use them to redeem a plane ticket or hotel stay. And voila, you’d have freed up more of your budget for more delicious food, more comfy hotel-stays and high-SES activities. If all that sounds attractive, we have even better news — applying for an air miles credit card before the end of the month could well earn you over $1,000 in cash. But first, more about the cards. Chances are, if you’re here reading this article, you’re at a loss about which air mile credit card to pick. We don’t blame you. Credit cards these days offer so many different perks — picking one from the pile is almost as difficult as choosing your meal at Maxwell. But fret no longer. 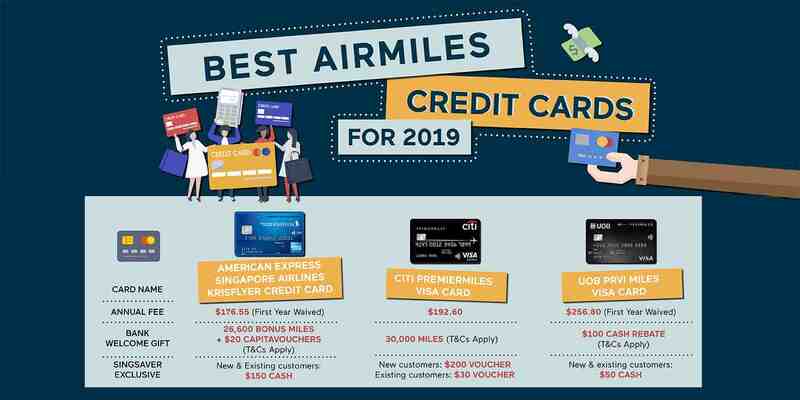 Below, we list 6 of the best air miles credit cards out there — courtesy of your friendly financial comparison site SingSaver. If you prefer cashback, read our guide to the best cashback cards for millennials here. 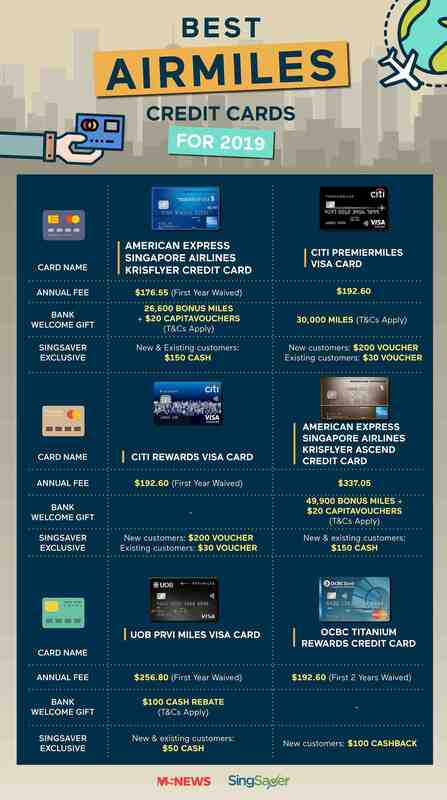 With an annual fee of just $176.55, the American Express Singapore Airlines KrisFlyer Credit Card has one of the lower upkeeps among credit cards. The first 6 months are a good time to earn some pretty bonuses — bonus miles, that is. Your very first spend using the card will give you 5,000 ‘welcome’ miles. Everyone loves a warm welcome. The welcome doesn’t end there. Spending $3,000 in the first 3 months, and another $3,000 in the next 3 months gives you a generous 26,600 miles — more than enough to redeem a flight to Bali for a short but no less liberating, by-the-beach stay. And let’s be honest, $3,000 in 3 months isn’t hard unless you’ve committed to the lifestyle of an ascetic mountain-living monk. 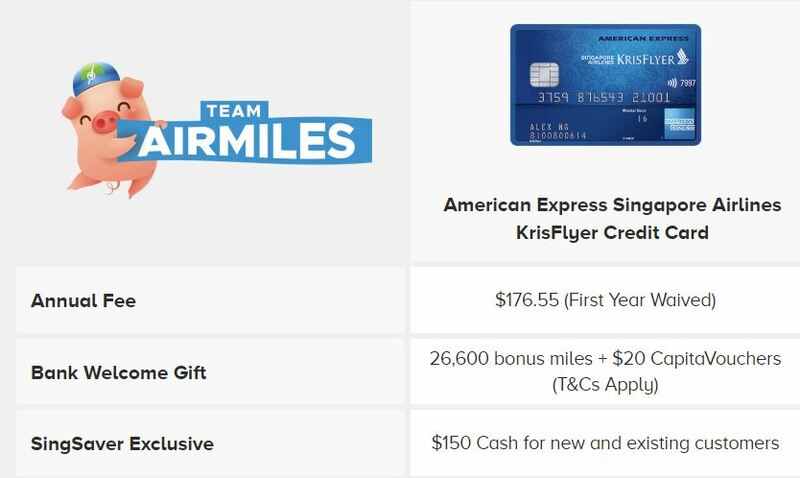 The earn rates for the Citi PremierMiles Visa Card are quite similar, except you earn 1.2 miles for every dollar spent — that’s 0.1 miles more per dollar than the American Express Singapore Airlines KrisFlyer Credit Card. Sounds insignificant, but in the long run, it may just translate into additional plane ticket for someone dear. The welcome gift for this card is more generous — 30,000 bonus miles. But this requires with more effort. You will have to spend $7,500 within the first 3 months to be entitled to this largesse. This welcome promotion ends 31 Mar 2019. If you have many things on the CNY to-buy list, now would be a good time to apply for this card and start crossing out those items. New customers: $200 voucher/promo codes. Existing customers: $30 voucher/promo codes. The Citi Rewards Visa Card is made for the fashionista in all of us. 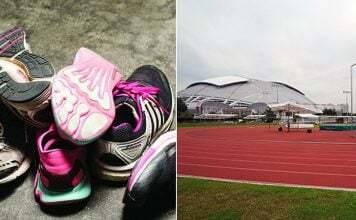 4 miles for every $1 spent on clothes, bags and shoes — there’s no better way to soothe the guilt of a gamely wardrobe splurge. In case you get most of your clothings from Taobao, no worries — the card will reward you all the same, with 4 miles per dollar spent on that Chinese portal of all things affordable. 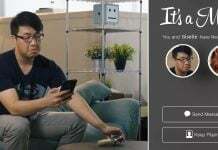 To drive home the idea that this is THE card for fashion-infatuated individuals, Singsaver will gift a $200 Takashimaya voucher for new signups. That’s right, more dough to shop for your favourite attires — or you could buy some real baked dough. Hold up. The annual fee is almost double those of the earlier cards — what’s the deal? Simply put, a much sweeter welcome package. 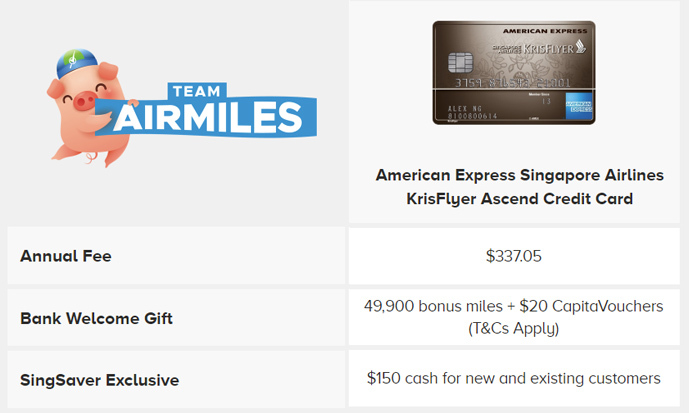 Your first charge on the American Express Singapore Airlines KrisFlyer Ascend Credit Card will pop 5,000 miles into your account. Spend $6,000 in the first 3 months, another $6,000 in the next 3, and that sum will grow to a tremendous 49,000 miles. That’s just 1,000 miles short of redeeming a pair of round-trip tickets to bustling Bangkok. 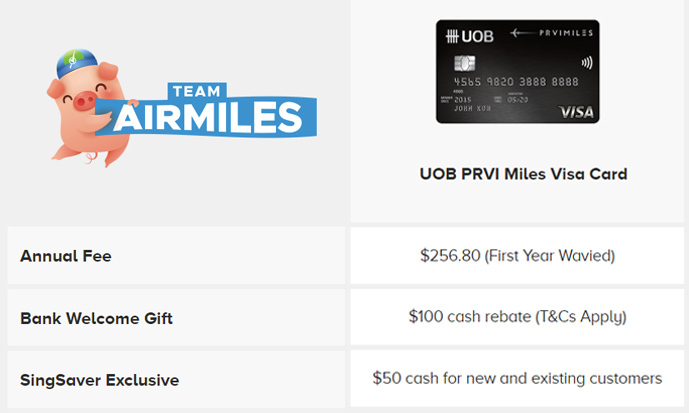 If you’re always the one in-charge of booking flights and hotels for holidays, the jet black UOB PRVI Miles Visa Card is for you. 6 miles/dollar spent booking plane tickets and lodgings online sounds like a steal. Do take note that this gem of a rate only works if you make your bookings through Expedia, UOB Travel and Agoda. At this point, you may even wish to offer your booking services to your kakis. Just tell them it’s your newly discovered hobby. They may look at you weird and start laughing, but you’ll have the final laugh when you land that free ticket to queue for the OG brown sugar pearl BBT in Taipei. So you’ve got this sudden compulsion to buy a lot of things — new clothes, bags, shoes, furniture, earphones, speakers, TV screen, and the list runs long. 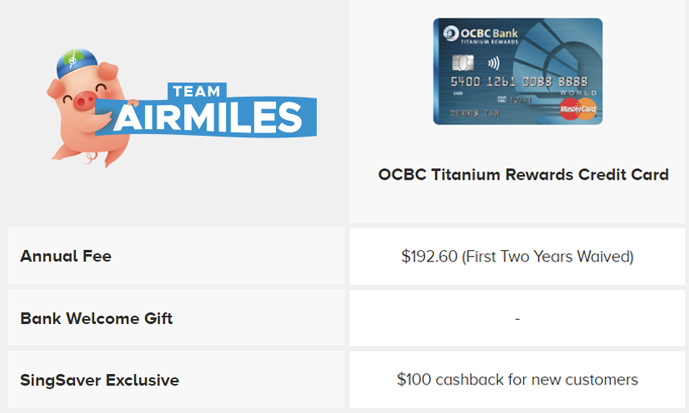 The OCBC Titanium Rewards Credit Card was made to accommodate such sudden compulsions. You get 6 miles per $1 spent — an earn rate that towers over what all the other cards offer. But the downside is that there’s a cap of 48,000 miles per year. That translates into $8,000 in spending. Which explains why this card is superb for a year-end shopping spree. You spend $8,000 to satisfy your compulsion, you hit the limit, earn a ridiculous number of miles, and you’re done for the year. And then it’s time to book that 50,000 miles ticket to soulful Seoul and enjoy a piping hot Kimchi stew amid the end-of-year snow. 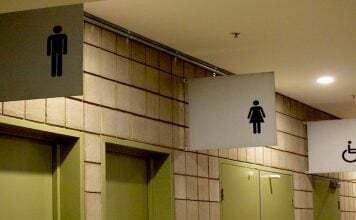 Retailers including Alibaba, Courts, IKEA, etc. SingSaver, your friendly personal finance comparison site, is the perfect tool for finding the best credit card for you. The site is a trusted partner of all the major banks in Singapore, so be reassured — they are legit. 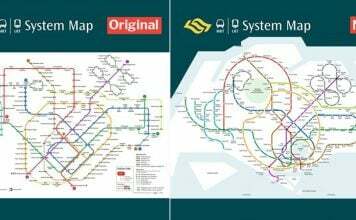 In view of CNY, SingSaver is running a limited-time campaign for would-be credit card holders divided into 2 camps — those who love accumulating Air Miles and those who crave Cashback. From now till 31 Jan 2019, every successful card application made on SingSaver’s #AirMilesVSCashback page will earn you up to $200 in cash and/or vouchers*. 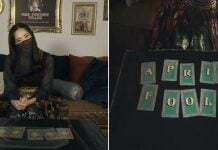 If you picked the right card and your “team” wins, you could top off your earnings with an extra $20 to $50 cash ang pow per card application. And did we mention, you can apply for both an air miles and a cashback card to guarantee your place on the winning team. The giveaway doesn’t end there. Head over to SingSaver’s Facebook page and comment on which you prefer — air miles or cashback cards. Remember to tag 3 friends along with your post. The top 3 most creative comments will each receive $888 in cash. Comments have already started rolling in. So you’d best get started before someone snatches your golden idea. If you’re going to be up in the air a lot, be it for business or leisure, do yourself a big favour by picking up an air miles credit card. There’s no better feeling at the end of a long, arduous year of working than redeeming a ticket to your dream holiday destination. 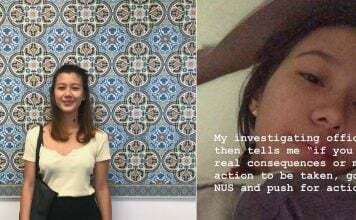 This post is brought to you in collaboration with SingSaver. *Terms and conditions apply. You can read more about the promotion here.